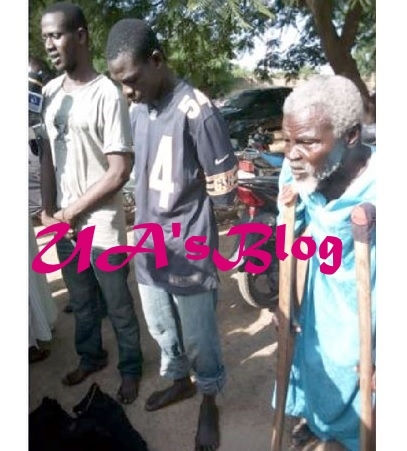 An octogenarian herbalist was yesterday, paraded by the gallant operatives of the Nigerian Police in connection with the beheading of a Police officer. The officials of Nigerian Police Force from the Katsina State Command, have on Wednesday, paraded a herbalist identified as Hussaini Musa, for allegedly beheading a Police officer attached to 56 PMF, Special Duty, Operation Safe Haven, Jos, Plateau State. Speaking while addressing newsmen shortly before parading the suspect at the police headquarters yesterday, the State's Commissioner of Police, Mohammed Wakili, said the herbalist was arrested with two others for beheading Sergeant Unana Ishaya. According to Vanguard, he stated that the suspects plucked out the sergeant’s eyes after beheading him, as part of requirements given to them by the herbalist, Hussaini Musa, for a charm jacket which will enable them to carry out robbery and afterwards escape arrest by disappearing. One of the suspects, Abubakar Sani, who also spoke to reporters, said that they wanted to use the charmed jacket to rob the EFCC office in Jos, where they suspected there was huge amount of money, without having to breaking in. The commissioner said operatives attached to the state police command’s intelligence bureau bust the cultists’ activities based on a tip-off. He identified the suspects as one Abubakar Sani, alias Abu Kwaya, 35; Abubakar Sani, alias Abu Dan Bauchi, 28, and the herbalist, Hussaini Musa, 80. Wakili said the command recovered the two human eyeballs in a plastic container, the axe used in beheading the Police sergeant, the dagger used in plucking the eyes of the deceased and some clothes.